Healthcare IT is facing the perfect storage storm. The amount of objects that need to be stored is growing rapidly. The size of those objects is increasing dramatically and there are more legal requirements than ever to retain and protect that data. All this is happening while budgets are growing slowly—if at all. 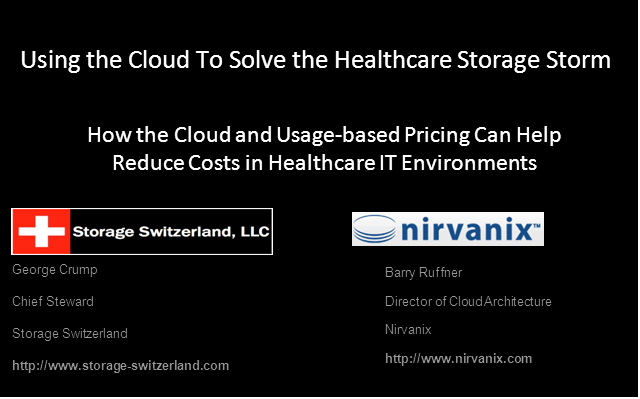 Join Storage Switzerland and Nirvanix for a live webinar “Using the Cloud to Solve the Healthcare Storage Storm” on Tuesday August 23rd at Noon Central. This informative webinar will feature subject matter experts who will discuss the key challenges that Healthcare IT storage managers face, outline the key ingredients—multi-level security, global namespace, ability to ingest and store millions of large images, guaranteed SLAs—that a cloud storage solution must provide, and will show how leveraging cloud storage can help survive the oncoming storm. 5. How to develop a storage solution that provides access to images at multiple/redundant locations without painful fail-over scenarios.